Emily, who lives in Imagine!’s Charles Family SmartHome in Longmont, has been testing a re-introduced University of Colorado School of Engineering Assistive Tech project, which uses an LED light and an infrared controller to teach cause-and-effect skills. Emily is enjoying it very much and has been doing a fantastic job adding her own color and flair to the house! Learn more about other awesome CU projects by watching the short video below. 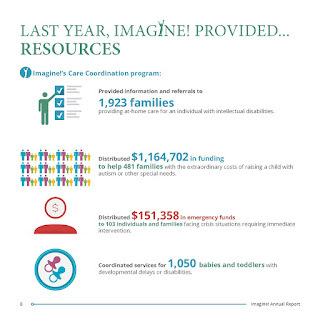 The 16th Annual Imagine! Celebration is scheduled for this evening. I’ve already given you a little sneak peek of what to expect, but I wanted to share one more tidbit. Tonight’s audience, many of whom are being introduced to Imagine! 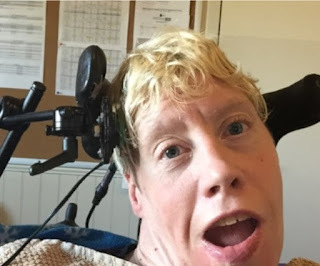 and the individuals we serve for the first time, will be viewing the video below to get a brief overview of the work our organization does every day to create a world of opportunity for all abilities. 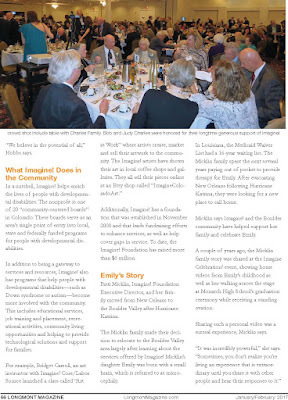 By the way, this year’s Imagine! Celebration is sold out, but it doesn’t mean you can’t still be a part of it. We’ll be posting pictures on our Twitter feed, and we’ll be using the “Facebook Live” feature on our Facebook page to broadcast key moments during the festivities. If you’d like to join in, be sure to use the hashtag #IC2017! Thank you to everyone who will be taking part in what is sure to be a remarkable evening! We are pleased to announce that we have a new puppy at the Charles Family SmartHome . . . well, sort of! 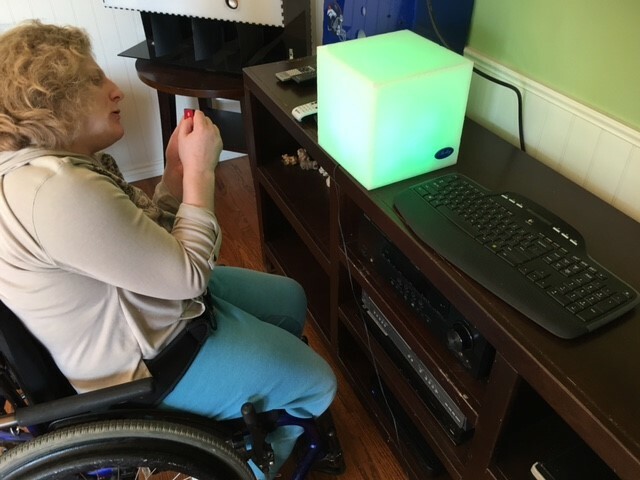 Zoomer, an interactive smart dog, has moved into the home! This puppy is a learning robot that utilizes voice commands (over 15 different commands), movement sensors, and chest sensors that allow him to know when he is near other objects, to interact with individuals, and to navigate around them (aka wheelchairs & stairs). This voice-activated pup has a big personality that's expressed through a seemingly limitless litany of tricks, tactile and verbal interactions, and routines. Zoomer can learn and interact with different users and be programed with customized commands, offering great learning opportunities for all of the SmartHome residents. 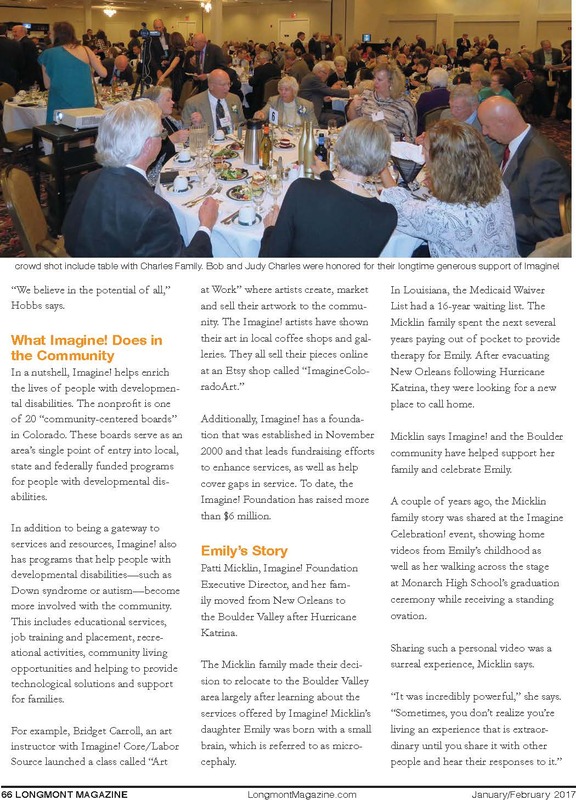 The Imagine! Celebration is one week away! Here’s a couple of related items to help get everyone excited for our annual fundraising event. 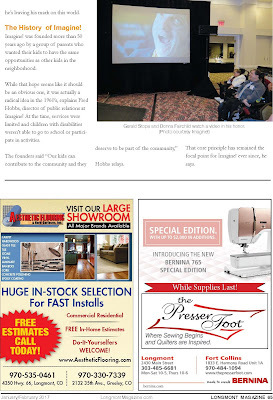 First, check out this short video highlighting the Celebration’s Live Auction items. 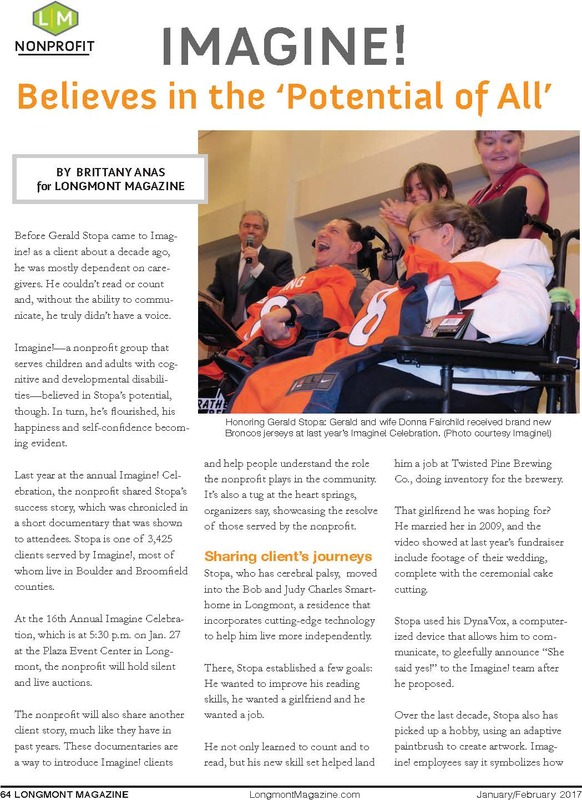 And last week, Longmont Magazine published a story about Imagine! and our Celebration, which you can see below. Click on the images for a larger view. Don’t get me wrong. Collaboration absolutely has its place in business, and certainly in the world of human services. 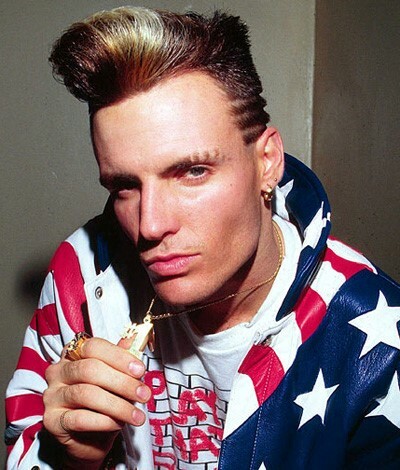 But maybe we need to start looking at collaboration in the same way we look at listening to a Vanilla Ice song: something to be done only after a great deal of forethought, and then only when absolutely necessary. Sadly, too often in our field we collaborate when it isn’t necessary, and therefore the results aren’t always pretty. We wind up with a patchwork of initiatives, committees, or task forces that remain far past their expiration dates. Why does this happen? I have a theory. Collaborative teams tend to be made up of two types of people. The first types are the ones who tend to be really skilled in their particular area of expertise and successful in their endeavors in those areas. They are highly sought after for their skills and make good, productive members of a collaborative team. But there is a second type of person who often winds up on collaborative teams. These tend to be people with strong opinions and lots of time on their hands, who want to be part of the team so they can influence outcomes. Too often, however, they end up influencing outcomes without being held accountable for them. Not every member of a collaborative team is created the same. However, in our field especially, that basic tenet is routinely ignored. People come to the table with unequal skill and knowledge levels and yet are able to influence results on an equal level. Having an opinion is not always the same as having a solid understanding of the facts and challenges surrounding any particular issue. 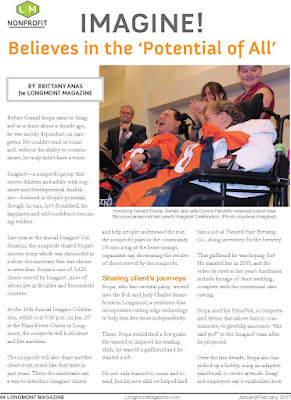 Creating a large system of services for people with intellectual and developmental disabilities (I/DD) requires a design based on expertise with opinions heard separately. Typically data and opinion is collected using prototypes, or focus groups; not as part of a system design team. I’m saying that opinions shouldn't be considered when undertaking a redesign, but that they should serve as data points rather than jumping off points. Influence without accountability is far too prevalent in the I/DD world. If we want to be successful in collaborating for system design, we need to do a better job of recognizing the relative value of the members of a smart collaboration. At a certain point, we need to gather data (and opinions) though hearing-like environments, then, in a separate room, put those with the best skills and expertise in charge of using that collection of data and opinions to find a solution to our many challenges. If we can’t do that, we risk staying mired in partial and ineffective solutions that do more harm than good, and that linger on too long while the people we serve continue to wait for that world of opportunity for all abilities. 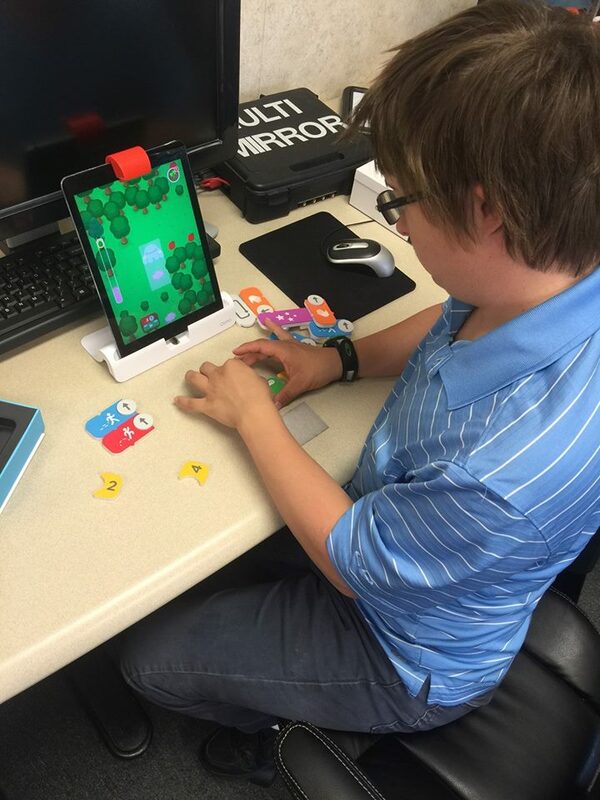 Here’s a picture of Joey, who accepts services from Imagine!’s CORE/Labor Source department, learning how to code using Osmo for iPad. The program uses the iPad's front facing camera to observe what’s below the iPad so he can actually receive in the moment feedback on his coding set up. Keep it up, Joey! 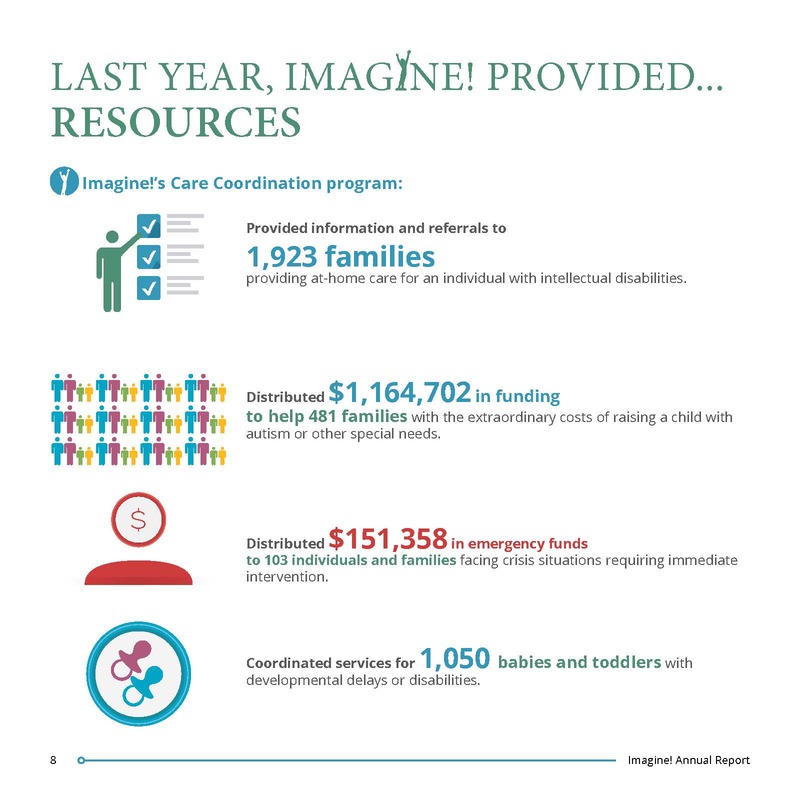 Last week, I asked you to help support Imagine! via Facebook. And wow, did you come through! Thanks to your "Likes," Imagine! 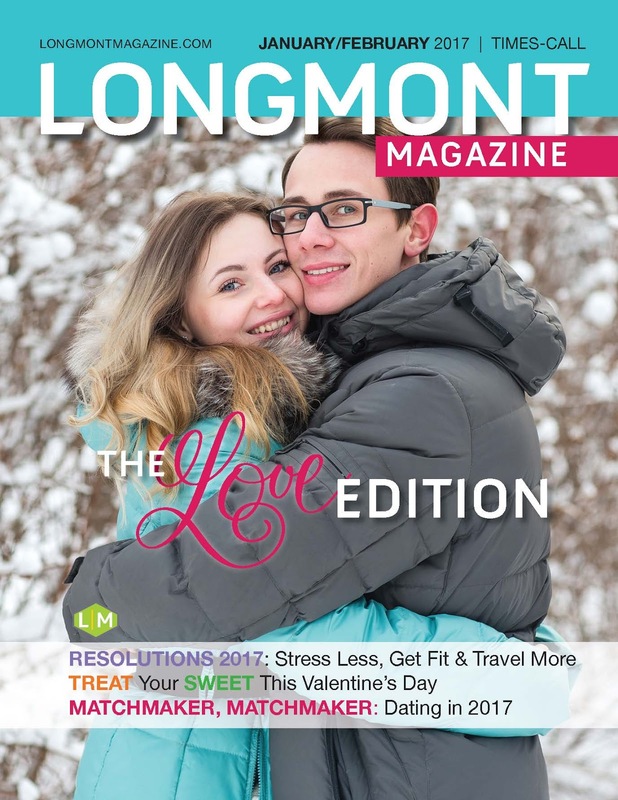 has been selected as one of three local organizations which will be receiving Lucky’s Market South Boulder’s reusable bag credits for several months, starting January 29. Thanks to all who voted, and special thanks to Lucky’s for its support of some really impressive organizations doing great things in the community. 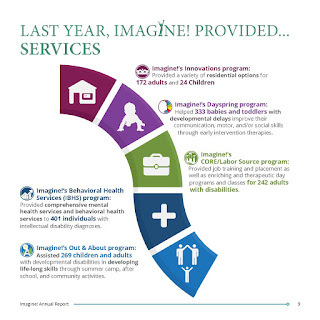 In addition to Imagine!, Blue Sky Bridge and Paradox Sports will also be receiving donations. 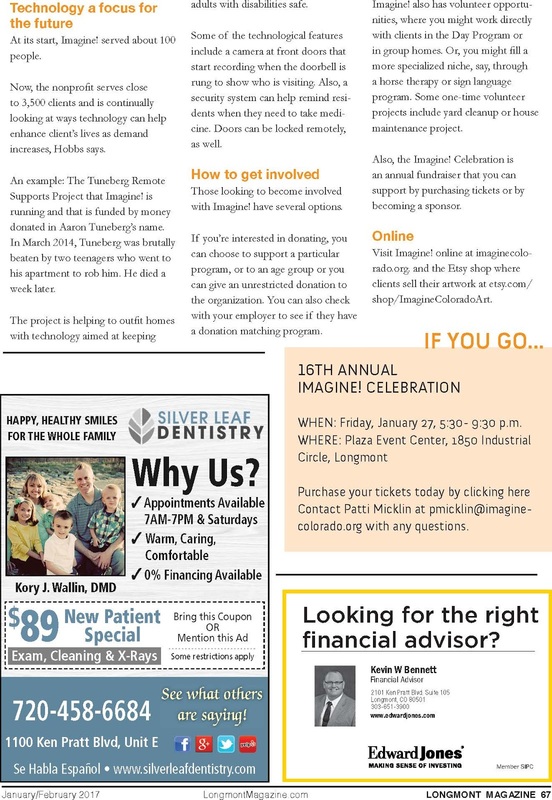 This week's Tech Tuesday comes from Imagine!’s Charles Family SmartHome, where Shelly is demonstrating her new iPad. Once the iPad had been set up, we had asked Shelly to show us some of the things she uses her iPad for, and the first thing she did was navigate immediately to the camera app to take a selfie. Check out the video below. This, of course, isn't the only thing that Shelly has been using the iPad for. Not by a long shot. 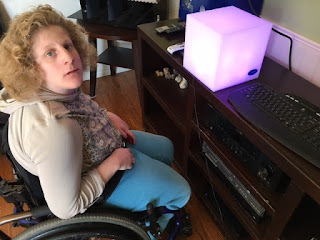 She also loves altering photos with various effects, she uses her iPad to independently navigate through Netflix in her downtime, she uses her e-mail to keep in touch with friends, as well as her guardian, and (probably her one of her favorite pastimes) uses her device for shopping online. Amazing work, Shelly, keep it up! And here’s the selfie she took! Here’s a fun way for you to use social technology to support Imagine!. 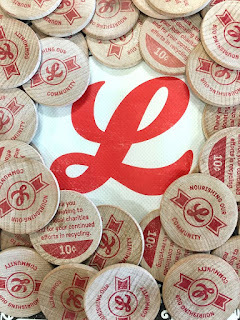 Lucky's Market South Boulder is using its Facebook page to select which organization will receive its next quarter's Bags for Change donations. They have selected five organizations as nominees, and Imagine! is one. 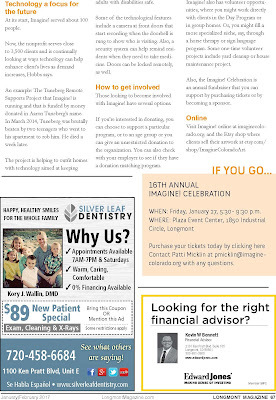 Here's how you can help us get selected: go to the Lucky's Facebook post linked here, then "Like" the Imagine! post in the comments. It's that simple! 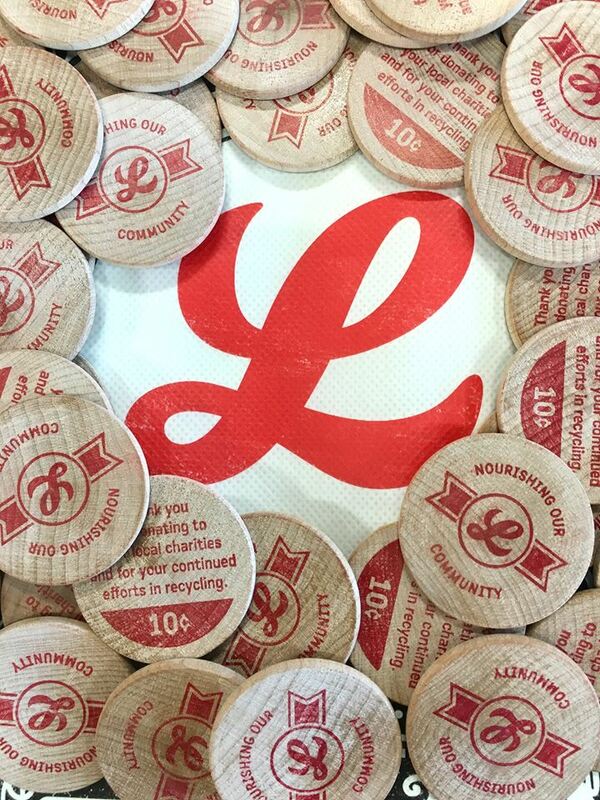 Thanks for helping out, and thanks Lucky's South Boulder for thinking of us!